Turn Your Scrap Into CASH Today! We give you cash on the spot for your vehicle. Do you have an old vehicle taking up space in your driveway? Is it damaged beyond repair, leaking oil and fluids, or will it just not drive anymore? Don’t look at that eyesore any longer; call Alpine Towing & Storage. Located in Oshawa and Scarborough region, we can quickly remove old, unwanted vehicles from your property and best yet—we’ll pick it up and pay you for it! Call us today. We pay some of the best prices for scrap vehicles throughout the Durham and Scarborough region. Simply pick up the phone and call us. With one short call, we’ll give you a quote over the phone for your vehicle and you’ll be free of that eyesore and have cash in your pocket. What could be better? So don’t delay, call Alpine Towing & Storage today. 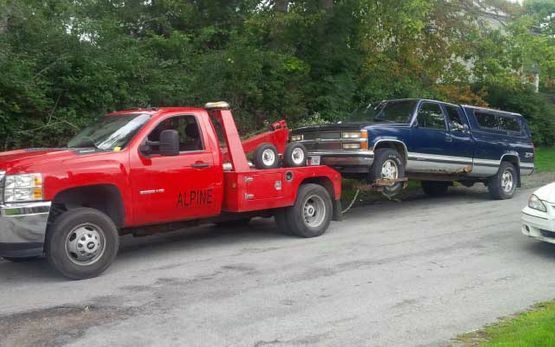 Selling your scrap car to Alpine Towing & Storage is simple. Look below to find out more about our process and how to have a more efficient transaction. Based on description of the vehicle you’ve provided us, we give you a cash quote over the phone. Upon your acceptance and confirmation of the quote, we make arrangements with you. Prior to our arrival we always call to inform you we’re on our way, and ask that you make sure that any personal belongings are removed from the vehicle. It doesn’t matter what sort of vehicle you’ve got; we can get rid of any vehicle for you including trucks, passenger vehicles, vans and more. If you’d like to know how much your scrap vehicle is worth, just give us a call and we can provide you with a quote over the phone. We are fully insured and will only remove your scrap car using equipment and trucks that are fit for purpose; we never use trailers or car dollies. Our team can come to you anywhere in the Durham and Scarborough region. There’s no need to put up with that old heap anymore. Call Alpine Towing & Storage today and say goodbye to scrap, hello to cash! Getting rid of that junker is as easy as 1, 2, 3.